With a few solid surveillance cameras in its stable, SpotCam’s latest offerings look to expand the idea of home monitoring by not only monitoring the security of your house when you’re away, but also its comfort levels when you’re home. The indoor SpotCam Sense ($150) and indoor/outdoor SpotCam Sense Pro ($190) are outfitted with all the surveillance features of a DIY home security camera along with a range of environmental sensors for tracking things like temperature and lighting. The SpotCam Sense HD Pro can be used indoors or outdoors and is protected from water and dust. 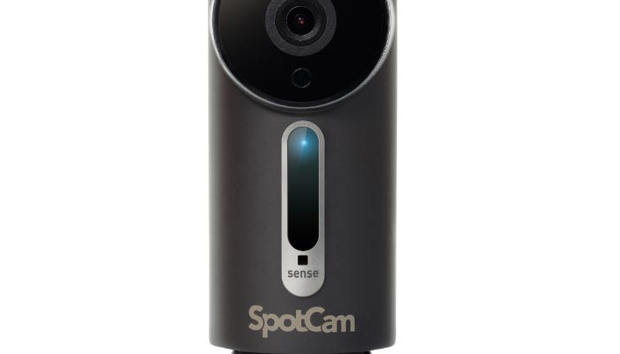 The SpotCam Sense Pro, reviewed here, adheres to the design cues of the original SpotCam HD. The camera is housed in a cylindrical body attached to a hinged stand. Top to bottom the unit is just under 6 inches tall. It can be placed on a table, bookshelf, or other flat surface right out of the box, or you can affix it to a wall or ceiling using the included mounting kit. You can also attach it to an exterior wall to monitor your outdoor environment—it has an IP65 rating for protection from water and dust. A 1080p HD camera with a 155-degree ultra-wide viewing angle lens is set into the top of the Sense Pro’s body. It’s surrounded by a ring of 12 IR LEDs for clear viewing in dark environments. The Sense also has an integrated mic and speaker for two-way audio, a handy tool for communicating with any family members you may be monitoring at home, calming an anxious pet, or scaring off a human or animal intruder in your yard. The speaker doubles to give you audio security alerts, including a built in siren. The Sense can be set up to detect motion and or sound and push notifications of these events to your smartphone. Additionally, the Sense boasts temperature, humidity, and illumination sensors and can provide real-time alerts to critical changes in any of these areas as well. The Sense records all home monitoring video to its cloud servers. You get a complete day’s worth of footage gratis; and the end of each 24-hour cycle, your new footage is recorded over the old. If you want to archive video for longer, you can choose from three storage plans: 3-day recording for $3.95 per month or $39/year, 7-day recording for $5.95 per or $59/year, or 30-day recording for $19.95 per month or $199/year. It took less than five minutes to get the SpotCam Sense from out-of-the-box to up-and-running. Once I positioned it on a shelf, I just followed the in-app instructions to connect it to my wireless network. There were no QR codes to scan or other cumbersome requirements; it was as easy as selecting my Wi-Fi from available networks and logging in. The SpotCam app displays fluctuations in temperature, humdity, luminosity, sound, and motion as line graphs. Once connected, the camera appears on the SpotCam app’s home screen, along with any other SpotCam cameras you have online. Tapping the Sense in the app takes you to the camera’s live feed. The 155-degree wide-angle lens was enough to take in my whole living room, with just a bit of image-bending on the edges. The image was fairly crisp, but colors appeared dulled. It was also difficult to make out details in shadowed areas or even around my chocolate-brown couch, which appeared almost black on camera. Any bright light fixtures or lamps, on the other hand, appeared with blinding halos around them. Night vision produced much better detail, particularly in those spots that were lost in shadow in daytime mode. The SpotCam app is pretty intuitive to navigate. Right under the live feed window are icons for controlling the camera’s audio, taking screenshots of the feed, and rewinding the video in 30-second increments. There’s also a share button for providing family members—or anyone else you want to invite—access to the camera feed. Just tap it to open an invitation email, customize a few of the party’s access settings, and send. On the bottom half of the screen is a scrolling timeline on which detected sound and motion events are clearly marked, so you don’t have to scrub through hours of footage. Beneath this is another toolbar with buttons for viewing event-triggered video recordings, using the microphone, and checking out your home’s “vitals.” This last displays in line-graphs of the room’s fluctuations in temperature, humidity, lighting, sound, and motion for the current day. These graphs scroll horizontally together so you can easily review changes in your environment over the course of a week or month. You can have the camera alert you to changes in any of these environmental indicators, just as you can for detected audio and motion, in the app’s settings menu. Just set upper and lower temperature, humidity, and illumination thresholds and the Sense will send a notification to your phone—or, if you choose the option, sound the camera’s siren—whenever they fall out of range. You can track environmental and security events in the SpotCam app. You can also schedule the camera to turn on and off automatically on certain days and times so you’re not inundated with alerts around the clock. If you want to use the Sense with your other smart-home appliances, you can access an array of IFTTT recipes from the app settings menu as well. Some of these directly enhance your home security, such as “Turn on Philips Hue when SpotCam detect sound” and “SpotCam take a snapshot when Nest Protect detect a smoke emergency,” while others, like “Ask Amazon Alexa to turn off SpotCam” merely add an element of convenience. Even if you don’t use any smart-home appliances, you can still take advantage of IFTTT recipes like “Turn on your SpotCam automatically when you leave your house," which uses geofencing to determine when you’re home or away. Overall, security alerts were prompt and accurate throughout my use of the camera. The environmental alerts were also accurate when compared to readings from other instruments, including a thermometer and hygrometer. Its easy to see how these alerts can help you maintain an optimum environment for a baby, elderly parent, or someone with a health condition. But they can also tip you off to security breaches—if lights have been turned on when no one is home, for example, or the temperature dramatically drops because a window has been opened. One drawback of the SpotCam app, however, is that although you can view recorded videos, you can’t download them directly to your phone. Instead, you must to log in to the MySpotCam.com web portal and cobble together a video from your surveillance clips. You select a period of time and choose between a “normal” or time-lapsed video. The result is saved to a tab called My Film on the site, and from there you can download the video to your local drive.